This year Ramadan started in the second half of August. Temperature in Damascus is in the high thirties and the day is really long, sunset is at 7:30. By the time the call to Maghreb prayer sounds fasting Muslims are desperate to get their hands on that glass of water or ice cold drink to kill their thirst. Before I go on to Rmadan drinks let me quickly explain why Ramadan comes in winter some time and in the summer some other time. Ramadan is the ninth month of the Islamic year. The Islamic year is a lunar year and almost 11 days shorter than calender year. Hence Ramadan comes 11 days earlier every year to complete a full cycle in 33 years. Drinks in Ramadan plays a star role on the Iftar table. Although this could be fresh fruit juice, the usual drinks are of the exotic variety (exotic for the Western reader, most Middle Easterners know and love these drinks). The first of these drinks is Erk-Soos a black mildly sweet and slightly bitter drink made from liquorice root. The process of making it involves put the ground roots in a muslin cloth and drop water over it drop by drop all night long. As you can see it is complicated and time consuming so no body makes that at home. Instead people buy Erk-Soos from specialised shops or from street seller like the one in the top picture. The second drink is Tamarind (Tamer Hindi in Arabic, literally translates to Indian dates) . I personally hate this one. It is sour and tastes of tamarind. not my cup of tea. Finally the drink most associated with Ramadan, Kamruddin or A'amruddin as we pronounce it in Syria. 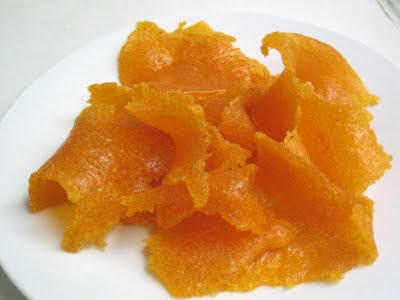 Kamruddin is sun dried apricot paste made by squeezing hundreds of kilograms of apricot, mix it with glucose syrup and spread on giant trays to dry under the summer sun. The final product is a tangy apricot leather-like orange sheets. Syria produces tonnes of Kamruddin every year with 90% of the production exported to other Arabic countries. All of it to be consumed over the month of Ramadan. In London you can buy Kamruddin in most Arabic supermarkets but almost exclusively in Ramadan. Cut the Kamruddin into an inch size pieces. Put in a bowl with the sugar and water and let soak for an hour. Stir occasionally and you will see the kamruddin starting to dissolve. Put the whole lot in a mixer and mix for a minute or so till all the kamruddin dissolve. Add the orange blossom water. 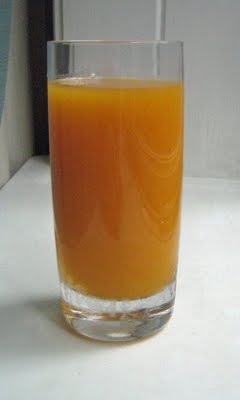 The drink consistency should be thick (similar to mango nectar). Chill in the fridge and enjoy. O lovely, I can try this, the apricot sheets are for sale up the street. Mind you, I LOVE tamarind, and plan to make tamarind drink this summer! It shouldn't take you a long time. You just need a rough chop. Tabouleh is the one that take ages as you need loads of parsley very finely chopped. And all the other ingredients going in should be equally fine. Do try it. It is lovely. We couldn't stop drinking it yesterday! wow! I love that picture of the drink seller in Damascus! Glad you stopped by, I got introduced to your excellent blog. I love your post on Sweida and Damascus. I need to find that baker in Saroujah now! That paste tempts me every single time I go to the store (where I shop, they sell it year round). I had no idea a drink could be made of it, but finally, with that recipe, the temptation will be satisfied! You should definitely try it. I am thinking of other ways to use A'amruddin. I am thinking it might be great in a Moroccan tajine. Very informative article on Ramadan Drinks look forward to trying this recipe. Now I'm definitely going to have to try it. I look at it longingly all year long, thinking, "hm... this is NOT going to be good for my diet" (though really? the makdous isn't doing me any favours either). Now I can't resist. I bet it'd be lovely in a tagine too. Thank you for this post! Can you tell me please how much is a glass of the Kamruddin? Sorry, how many dollars does a glass of Kamruddin cost?